This video is proof positive that having your camera, phonecam or vidcam to hand may help you capture the visit of an unusual visitor to your area – one who might have then flown on and never returned. Here, the pressing of a shutter has saved the moment – a woodland bird in a suburban London garden. 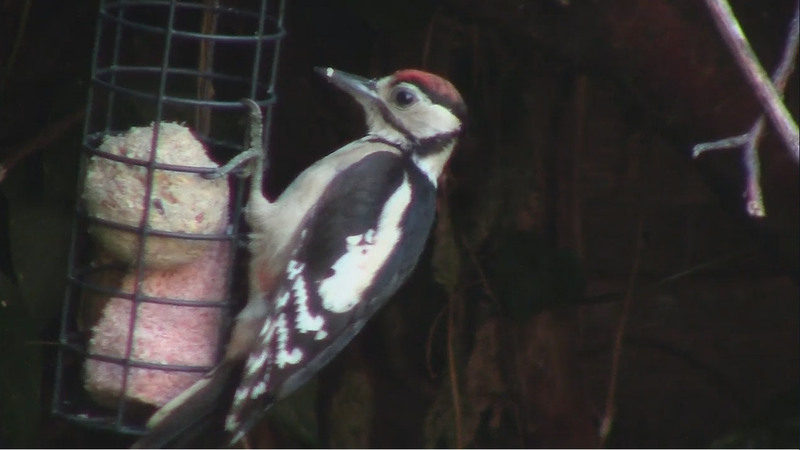 Before it was trashed by a developer, the little woodland behind our back gardens was visited by a great deal of wildlife, including The Great Spotted Woodpecker. This bird, one of over 180 Woodpecker species worldwide, is known for perching on the sides of trees, tapping on the bark until it finds a grub or some such creature beneath, & using its head like a jackhammer to drill a hole in the tree with its strong pointy beak & extract its protein meal. Here in our garden this Woodpecker’s unexpected choice of food was suet – from a suetball feeder. 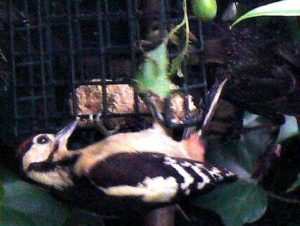 The high def vidcam, a Canon Legria R306 set up on a tripod in the garden flat window, was activated when the bird appeared. 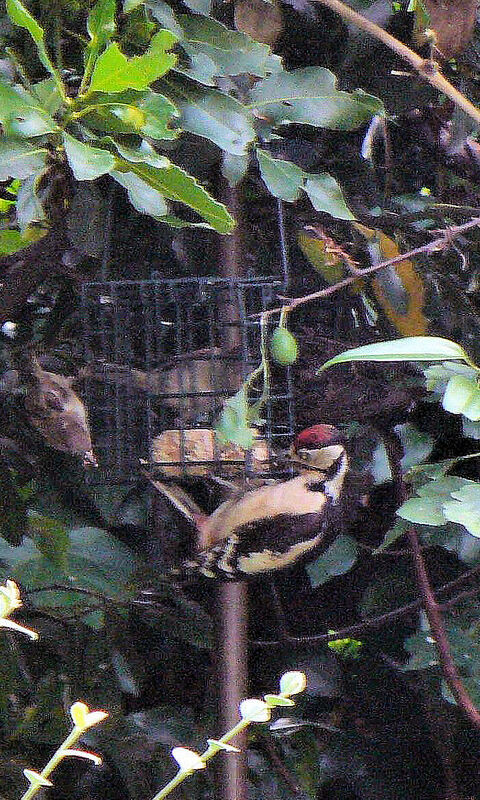 When it returned a few days later to visit the treat block feeder, these stills were captured with the Lumix Panasonic DMC-TZ5 camera – taken from the top window in the house. “The woodpecker’s strong, pointed beak acts as both a chisel and a crowbar to remove bark and find hiding insects. It has a very long tongue, up to four inches in some species – with a glue-like substance on the tip for catching insects. Remember, if there is a bit of undeveloped ground with mature trees in your area, don’t take it for granted. Watch out! A developer or architect may be about! Even the tiniest plot of scrub or vegetation being used by hard-pressed wildlife will be seen as a possible cash cow to a developer. Look into TPOs (Tree Protection Orders) & join with your community to safeguard as much of your local Nature as you can.